Booming Ballistic Bamagrass from Cullman, Alabama could be the bumpersticker on David Davis' bus. This band knows how to lay it down right, and their tap root into tradition is deep. Davis' father and grandfather were both musicians. In 1938, his Uncle Cleo (then an Atlanta ice truck driver) answered a newspaper ad in need of a guitar picker and singer of old-time songs. Thus, he became Bill Monroe's first Blue Grass Boys. Although David's father lost a hand in World War II, the family's strong commitment and loyalty to the music never faltered. With this kind of pedigree, you can almost see the bluegrass flowing in his blood. You can certainly hear it on this album. Gary Thurmond originally formed The Warrior River Boys in the mid-1950s but health problems resulted in his turning the band over to then 23-year-old David Davis in 1984. The visionary frontman plays mandolin and sings lead. Album releases (on the Rounder label) in 1990 and 1994 were the precursors to his current affiliation with the other biggie in bluegrass, Rebel Records. 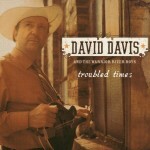 "Troubled Times" follows his near-perfect 2004 album that introduced fiddler Owen Sanders (formerly with Doyle Lawson& Quicksilver) as one of the Warrior River Boys. Bassist Marty Hays has also been in the group for several years. Since their 2004 release, Josh Smith (banjo) and Jeff Griffy (guitar) have moved on to other endeavors, with the current band configuration including Daniel Grindstaff (banjo) and Adam Duke (guitar). The band shines on Davis' original instrumental "Evening Prayer Blues." A common complaint of mine is that CD jackets are often no longer providing any more than song and musician credits, and perhaps a few thank you's. Although lyrics would be nice too, could we please just get a page of the CD jackets dedicated to some narrative about the band, its members, and some background about the songs and their inspiration? For example, wouldn't it have been nice to know that "Filling the River with Tears" was written by the same Randall Franks, an actor who played Officer Randy Goode on TV's "In the Heat of the Night." It took research to determine that the song is inspired by a poem written by Evelyn Rose Brock. Davis found it to be a great piece of very well written music, with all the necessary ingredients that he looks for -- interesting story, opportunity for good harmonies within the melody, and a bluesy feel.